The miracle of hindsight is that its 20-20. There are a few significant artists that looking back, it’s hard to believe that I ever cared about. Some artists have their ups and downs yet manage to keep me engaged and ultimately caring. Simple Minds. OMD. Even Duran Duran, to a point. Others, seemingly cross a line and never manage to make me care again. In 1980 I first encountered Midge Ure when fronting Ultravox Mk II on the “Passing Strangers” video. That band hit my consciousness like an atom bomb and were an almost never repeated phenomenon in my experience. Overnight I had to buy all the previous Ultravox albums, the Visage records, and anything that Midge Ure chanced to work on in a rare casual moment. He had the occasional solo single. He produced records for other people. He recorded the occasional left field side project. All of it was of great interest to me but like the frog who is sitting in the pot, unaware that the water is gradually reaching a boil, I was late in coming to conclusions that I should have arrived at much earlier. At first, it was all good. Ultravox finally sold records by 1981 when the UK market finally caught up to their euro-syth rock aesthetic. From 1981-1982 was truly this man’s peak. All of the Ultravox singles were hot stuff for sure. The band had successfully mined the foundations that the earlier John Foxx-led version of the band originated well enough. The band could all play and arrange like fiends, and if they didn’t have anything to really say, one could still manage to get lost in the accomplished music. There were also one-offs like the Phil Lynott “Yellow Pearl” single that is Midge Ure in all but name and voice; he wrote and produced the record and probably played half of the instruments on it. Sure, it’s a rip of La Düsseldorf’s “Menschen” but… it’s a hell of a great ripoff of La D’s centerpiece of their “Individuellos” album! It can be argued that it’s a perfect refinement of same and I’ll still give it the time of day, knowing now its blatant derivation. 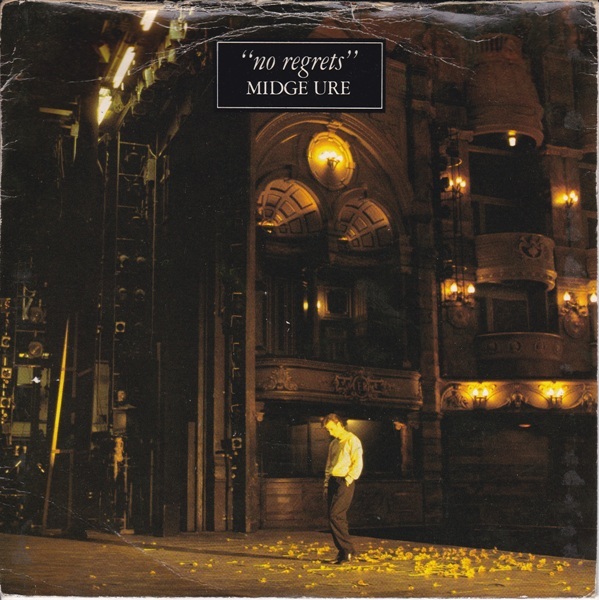 1982 brought the first Midge Ure solo single and it was his great synth cover of Tom Rush’s “No Regrets.” It’s another great single but once again, there is a precedent being followed closely by Ure. His arrangement, though synth laden, follows closely on the Walker Brothers 1975 UK hit version, though I was not aware at the time. Still, this was a record that sounded fantastic and I have no problem listening to it today. But after 1983, in retrospect, something happened to Midge Ure. Had I been paying attention, I might have pegged the seismic shift to when Ure shaved off the spiv moustache and pointy sideburns. One really can map his musical glory days to his facial hair styling! But it’s not that facile, really. 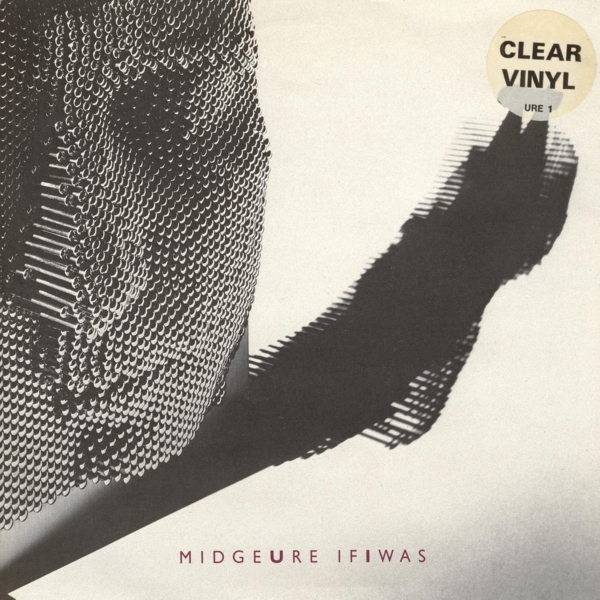 Hindsight and accumulated wisdom gives me the lens to view Midge Ure with more accurately in 2013 than I was capable of doing 30 years earlier, when I was still a fairly enthusiastic cheerleader for his work. What I see now is that Ure was a great craftsman, but not an artist. He really has nothing to say that interests me, artistically. Moreover, he is derivative as the day is long. He was known to be enthralled with “Systems Of Romance” and admitted such in his autobio. So when the opportunity came to connect with Billy Currie in Visage, he rode that bronc until he busted it but good. Fronting Ultravox was a dream gig for the young Ure, already with a storied CV backing him up by that point. But Ure was no John Foxx. Foxx was 29 [!] by the time Ultravox released their first single. He had graduated from University and had begun forming his worldview, which has informed his art to this day. Ure, on the other hand, dropped out of school at 15 to front the teenbop rock band Slik. He scrambled from that point on for toeholds in the industry with increasing success, due to his technical skills, which are nothing to sneeze at. But when dropped into a recording studio, what did he really have to say? Not much, by the look of things. But as long as he was skillfully pastiching La Düsseldorf, Scott Walker, and even John Foxx, I didn’t care. I was young and callow at that time and lapped it all up dutifully. <FLASH FORWARD 33 YEARS> Where it became a problem is when I accrued enough breadth of knowledge to see all of Ure’s derivative gambits for exactly what they were; smoke and mirrors by someone frantically hoping that his audience would not notice. By 1984, the jig was up. The market had moved to blue-eyed soul by then and Ure’s Krautrock cops held little sway in the fickle UK marketplace. It was at that point that things really headed south for Ure! His first serious solo single in 1985 was simply ghastly. I was appalled when I bought the single for “If I Was” and played it to the accompaniment of my own very slack jaw. It was so bad, that I most certainly did not run out and snap up his solo album, “The Gift.” I waited until the third single from same managed to move away from the sappy pop that typified the first two singles from that disc. If I hadn’t been so strongly conditioned by years of collecting, it would have ended there. But I kept up with Ure throughout his seriously diminishing solo career, which was mostly filled with anguished songs of what a miserable, unworthy cuss he was and how it was all just a big mess. And these trite sentiments were increasingly paired with music which no longer drew from Ultravox, Scott Walker, and Krautrock. What he delivered sounded much closer to Phil Collins, truth be told. By his third album solo album, the indigestible faux-Celtic sap that was “Pure,” I stopped collecting all of his singles. I then waited years to buy his next two solo albums at a cheap used price before I eventually gave up all together. When Ultravox reformed back in 2009 my gut feared the worst. Oh sure, the live album sounded terrific! Ure, in fact, was singing better than ever! The live concert 2xCD+DVD is truly the finest Ultravox live album out there, Billy Currie’s bum notes not withstanding! But I really didn’t want to hear them in the studio ever again. But my vote was overruled, and look where that got us. After hearing last year’s “Brilliant” album, I finally made the effort to cut the cord that bound me to Midge Ure for several decades longer than I should have allowed it to. If I knew then what I know now, I would have stopped buying anything with his name on it post-1984. The good stuff peaked in 1982, to be brutally honest. He’s not a bad guy. I’d share a dinner table with him. His work for Band Aid is very admirable. His confrontation of his alcoholism shows he’s moving forward as an individual. More power to him, but I can see now that the combination of his craftsmanship and my naiveté combined to make of him an artist in my head when that was just not the case. I’m no longer that callow fan, and he’s no longer even the spiv who knew which licks to lift. This entry was posted in Core Collection, New Wave Hall Of Shame. Bookmark the permalink. Nice analysis. I still think you’re overly harsh on Brilliant, but at least your opinion on the matter is well considered and weighed against 30+ years of history of fandom. I though that the old Midge may have been coming back around 2000. By no means do I think Move Me is a great album, but I think its better than his earlier solo work, and worth a listen every now and then. It could possibly have been a new direction, but he never followed up on it. Anyway, I’m not ready to write him off. Brilliant may not have been so brilliant, but it’s his first step in the right direction as far as new music goes in over 10 years (if you count You Move Me), and over 25 if we go back to Lament. At least he’s back playing with musicians who want to play the “right” (for lack of a better term) style of music. Zoo – “Move Me” had one good cut in my estimation. “Monster.” Where did that come from? Have you heard anything from “Ten?” I sampled it on iTunes. It was beyond horrific!! Truly, “Brilliant” seems like a step up, in truth when viewed against that context. Well stated Monk. You know we are of a fairly like mind on Ultravox, Foxx and Ure. I gave up on Ultravox and Ure by the U-Vox album, which in itself was 2 yrs later than I should have. I should have known when I bought the PVC sleeved U-Vox album that the packaging was 10 times as good as the music within. I owned The Gift – I gave it away with apologies. Brilliant is the most ridiculously titled album I can think of – because it just IS NOT. There are moment on it when you think, okay maybe they will go there and then they don’t. Ure sounds dead throughout most of the album as well. For all the fan generated hype that Ultravox dabbled in pre-release, I can only think they must be ashamed of the results. Your Phil Collins comparison is pretty spot on. Both men in search of a sound and losing their way. Echorich – Actually, it was my wife that brought up the Phil Collins comparison. We were traveling somewhere and I pulled the CDs for the trip. I thought, “that might be nice to hear” as I pulled that Midge Ure “best of” with a good selection of A/B sides. It’s his least objectionable solo album. Never the less, about 2/3 through my wife said to turn it off and compared it to Phil Collins! I think it’s a harsh but fair judgement on the man. I’ll always like him for his peak years, for the recent live album, for his very early Foxx covers when he had just taken over in the band (they’re really nice, just different enough from Foxx to be noteworthy), Live Aid and a bunch of other things (mostly Visage and related), but without real songwriters to work with he has only his (admittedly strong) technical skills to fall back on, and clearly they’re not enough. He needs to take a hint from Trevor Horn and Ian Broudie and help shape real artists … that he might be really good at. chasinvictoria – Bingo! You hit the nail on the head. He was threatening to do just that around ’81/’82 but his Ultravox duties pulled him away from his production career. By now it’s too late for such a reinvention. As much as I don’t like to read anything bad about our Midge, I feel I have to agree with you in general. I’d extend his peak years to 1978-1984 and I even find his solo stuff from 1985-86 rather very good (certainly preferable to most of “U-Vox” and almost anything that followed), but yes, from what I gather, sometime in 1983 something broke and he started to lose that spark he had. Whether it was a failure to conquer USA or that Ultravox reached the peak of their popularity in the UK, or maybe he succumbed to his ego and wanted to be recognised as a credible solo entity, not “Midge Ure of Ultravox” (certainly helped in that by his manager), but he started to drift off to something I’m not sure he knew to what or where. And then that dreaded Band Aid/Live Aid thingie wounded his creativity mortally. I don’t know if you should judge him that harshly, though, – he “grew up”, got married, had kids… He was seemingly manipulated by the management, he was lost in that big world of showbiz, a humble by character musician and technician, trusting and not really knowing how to push his way forward (that Geldof bloke upstaged him at Live Aid and Midge didn’t know about it for years!). No wonder he tried to play it safe (and he had that mainstream tendencies all along, truth be told). And then, in the 90s, showbiz started to change dramatically and he was just no longer needed, left to play all those boring acoustic shows to a handful of fans… Pretty bad unravelling for the man who had such a successful and seemingly seamless carrier for some 10+ years, during one of the most turbulent periods in music! Just imagine being trumpeted as a “future British Sinatra” (amongst other things) and then be dumped within a couple of years! I actually pity him now that I know all of that. Of course I don’t imply you should reevaluate his solo legacy – I have little time for most of it myself. Just want to offer another perspective on the man. And big yes to a suggestion for Midge to play “Trevor Horn” – his productions during 1980-1984 show a deft and able producer, capable of a really strong stuff. And it’s interesting that afterwards he just dropped that fruitful side of his carrier – was he bored or tired of not having hits with other acts and, therefore, respect that he longed for? His story seems to be of the able man who didn’t have a mentor, a guidance, and since the mid 80s didn’t really know where to go. And having no other qualities outside the music business, languished without a helping hand. Sad stuff and it’s actually suprising that he’s still alive and sometimes even kicking! Vlad – Welcome to the comments with your pithy commentary, which was very well considered! Again, I might point out how he left school to be in the group that eventually became Slik and he failed to get the seasoning that college reasonably provides. Like Bowie, he had to rely on his innate curiosity and autodidactisicm to carry him forward. Unlike Bowie, he probably stops short of the sort of intellectualism that his influences were capable of bringing to bear on their art. His obvious aptitude for music got him as far as he got, which was, let’s admit, a fairly spectacular and varied career incorporating writing, playing, producing, and even directing for others! I think you hit the nail on the head in your last paragraph in referencing his need for respect. His Glaswegian roots were very modest and I’m sure they have an impact on his motivations. And you are so right about management pulling the strings. It was Morrison who was behind the Ultravox reunion. It never would have occurred to the band, who had all moved on, but he smelled money and convinced them that it would be very good business to reunite. That, as they say, was that. Deepest apologies for the delay in posting your excellent comments, but they were caught in my spam filter. I’ve seen to that now. Aha, so you actually recieved my comment – I thought it got wiped, and didn’t have time to re-write it :o) No problem, spam protection first and foremost! You pointed out a fact that I didn’t pay attention to before – that Midge didn’t have an education beyond school. He even wrote himlsef that he didn’t excel in anything other that art, and I remember reading that he told that his favourite book was the autobiography of Errol Flynn (?). So that comment of yours seems very apt – his lyrics, for example, while I don’t find them prosaic, still lack certain qualities, are more… I don’t know, streamlined, if that’s the word, then that of Foxx. It’s interesting that the lyrics for “Vienna” (which, for me, is their best album in any incarnation) were mostly written by Warren Cann – and they have that certain something, like a ghost of Foxx years. After that it’s not quite the same. Even though overall I enjoy UreVox more than FoxxVox. And talking about music, John was (and is) a big fan of psychedelia, which filtered to the Ultravox! music, while Midge took off more of a rock/blues scene. Maybe that has something to it – though Midge wasn’t, of course, the sole writing force in the band, and I have a feeling that he even wasn’t the lead force (it has to be Billy – here’s one really overlooked musician from that era!). And when he went solo, he really floundered because of that. I also find it confusing that Midge is such a guy with quite a grasp of the latest technology, even to this day, – and at the same time it really isn’t apparent in his music, which has very traditional qualities to it! I remember reading how “Answers to Nothing” “isn’t far removed from Ultravox” – and then having a hard time listening to it as it’s not like Ultravox at all, especially in the arrangements! Why it is that? Commercial/mainstream aspirations or pressures? Fears of failure as an experimenter? Or are they (technology and music) just two separate entities to him, like hobby and work? I didn’t see it addressed in any of his interviews. Is that really is so? Midge first wrote the skeleton of “Yellow Pearl” during Lizzy’s tour of Japan in Summer 1979. The finished version was released on April 1980 on Lynott’s “Solo in Soho”. La Dusseldorf’s “Individuellos”, that contains “Menschen” was released the same year – I haven’t found a more precise date yet, but German Wiki entry gives it as 31 December 1980. 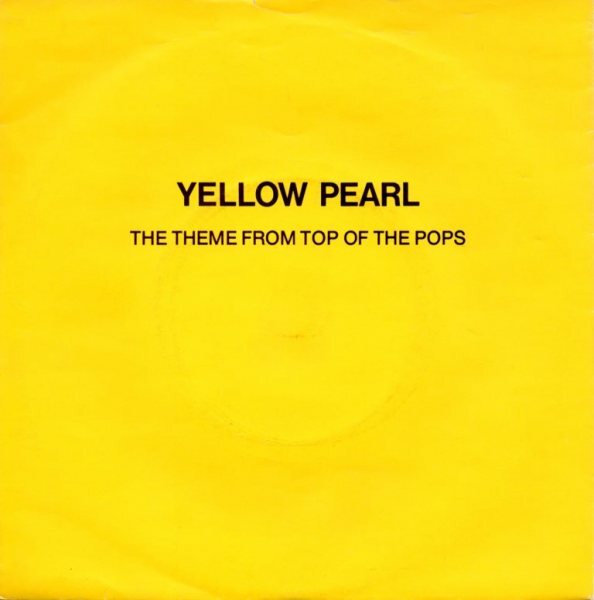 Anyway, I’m not at all sure that “Yellow Pearl” is a rip-off or even derivation – looks like it’s a wholly original composition.